I have been asked to join a group of interested persons who wish to continue to pursue the diversion of the freight service through Truro rather than the Adelaide Hills and City. While I feel I may be wasting more time and effort I still believe this is the only realistic long term option for freight, especially as the desire to use freight services increases and trains are longer and double stacked. The current proposed grade separation only seeks to move freight more quickly through the City and is unlikely to improve the amenity of many people. I will keep you posted after I have been to my first meeting in October. The following appeared on the Adelaide Now website today and will be in this week's Eastern Courier. THE community has been left in the dark about the State Government's project to separate train lines at Goodwood, residents say. Millswood Cres residents, whose homes back on to the train line, say they have been given little or no information about imminent works to separate the freight and commuter rail lines near Leader St.
John and Mary Vanderkolk, who have lived on Millswood Cres for 32 years, were angry about the lack of information. 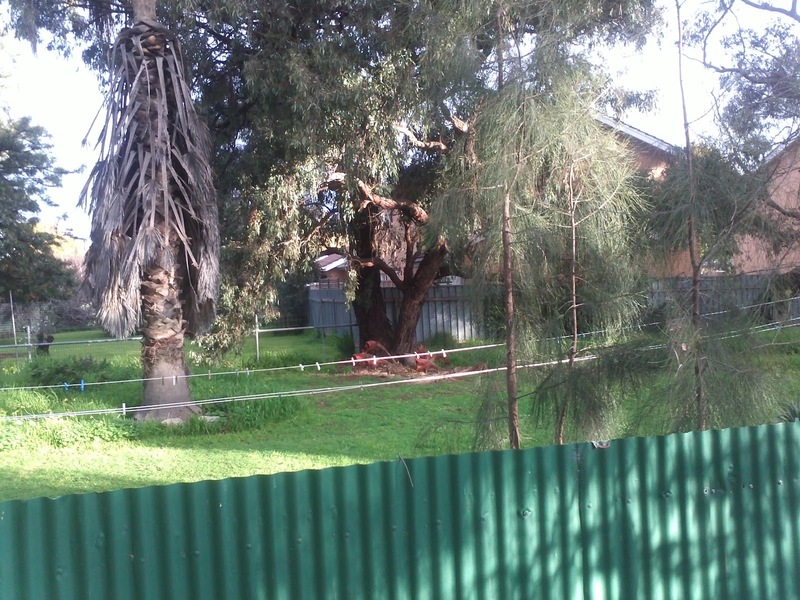 Transport Department staff visited the couple's house about six weeks ago to inspect a tree close to the property's back fence. "They said they'd send out the information and we've got nothing," Mr Vanderkolk said. Deidree Wilson was also disappointed. "The first I knew about it was when I was walking through the park and saw the signs that were put up by a local councillor," she said. 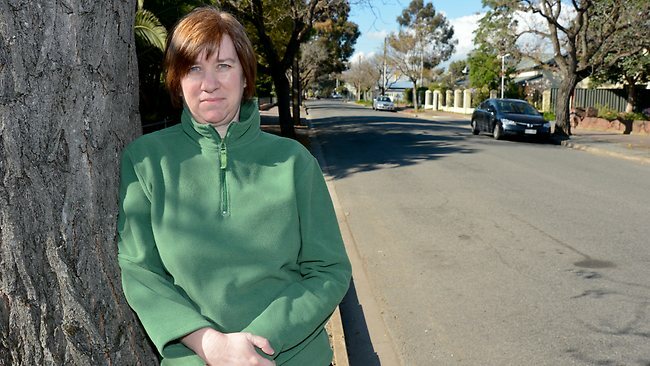 Unley councillor Jennie Boisvert said she had received dozens of emails from worried residents. "They're concerned about dust, noise, significant trees, rehabilitation of the area and the diversion of Brown Hill Creek," she said. She has called on the Government to hold a public meeting next month to inform residents about the plan. A Transport Department spokeswoman said it had doorknocked the area and briefed Unley Council and community groups. The Goodwood grade separation is the first stage of the state and federal governments' $443 million upgrade of the Goodwood rail junction and Torrens junction at Bowden. Meanwhile, Brown Hill Creek will be diverted to make way for the Goodwood rail underpass. Under the State Government changes to the rail line, a new passenger line underneath the freight line near Leader St would disrupt Brown Hill Creek's course and a culvert would be needed to divert its flow. Brown Hill Keswick Creek Stormwater Project director Michael Salkeld last week told the Eastern Courier Messenger it was too early to tell how the rail upgrade would affect the plan to help flood-proof 7000 homes along Brown Hill and Keswick creeks. "We are continuing to work with and be guided by the Department of Planning, Transport and Infrastructure to determine how Brown Hill Creek and proposed stormwater bypass flows can best be accommodated by the rail project," Mr Salkeld said. A Transport Department spokeswoman said the government was working with the Stormwater Management Authority, and Unley and Mitcham councils to work out how to divert the creek. Nomination for the Energy Consumers Council; Sounded interesting but you need to be an expert in some area of electricity supply. No one was nominated. Elector Representation Review; This is an important one for all of us; do we like the ward structure, the number of representatives per ward and the election at large of our Mayor or do we want to see changes in this?This review is a legislative requirement. However, we must make some minor changes as the wards must have approximately the same number of electors and this is not currently the case. The removal of many from the supplementary role due to failure to re-enrol (another problem with legislative changes) has seen a significant drop in voters in some wards. In Fullarton the increasing numbers in retirement villages has added to it's numbers. I would like to see our Mayor elected by Councillors after the election of Ward Councillors; these people know the capabilities of the person they elect as they may have worked with them for many years; they are not fooled by slick campaigns or words that are not carried through to actions. PASSED. This will now go to Consultation. Tennis SA has applied for a Liquor License for it's Chelmsford Ave club rooms. This was revealed in the most recent minutes of the Goodwood Oval Management Committee. All residents nearby should receive a notification of the hearing date and have an opportunity to express any concerns they might have. I haven't been able to ascertain the proposed operating hours. They are also considering a change of use for the front 4 courts that will be dealt with as part of their lease agreement renewal and/or a development application as a change of use. This is regarding more use for the club and potential loss of some access to local people. Winner of the 2010 Recreation South Australia Aquatic Facility of the Year Award. Please Note: Season begins 15 September 2012 until 26 May 2013. We greet dedicated lap swimmers and welcome water babies. Dive in to our clean, heated water or paddle and splash with your goggles and noodles. Relax and float away before cooling down at our Café. Tell us what you think - we love customer feedback. Water Safety - make sure you know how to be safe around water. From this to this, almost completed and looking good. It's not hard to tell why people think these trees are the ideal street tree! View our Events brochure online and book your place at the event. The brochure is available at Events @ Unley Libraries Septermber 2012 Festival Special (899 kb) . The programme for the weekend looks interesting and full. Some things you need to book for, most are a gold coin donation or free. Last nigh Don and I met with John Devine, the General Manager for infrastructure, to get a briefing as to where DPTI and Council are at with this project. The final date for Council's submission to the DAC has been pushed out to Wednesday 19th September. So while it is too late to write your own submission it is not too late to let me know how this will effect you and how making it different in some way will ease those concerns. We still do not have a date for a meeting with residents but this may take the form of residents being invited to listen and participate in a Council briefing or a meeting specifically organised by DPTI. My suggested location is Clarence Park Community Centre and suggested date was the earliest possible date in October. DPTI are now actively trying to find a solution that will not derail the No Dam option for storm water management in Brownhill Creek. This means they need to find a way to allow 38 cubic metres of water per sec to pass in at least one point under the train line. The solution we saw may take the current water from the creek into a culvert that would now run north along the railway line. This would need the acquisition of at least one more property and an easement over the other properties. The water from the Arundel Ave culvert could then run along the length of Arundel Ave and into the original creek bed. This all sounds pretty tricky but looks better in a diagram. DPTI would still have to allow for a smaller culvert at the western end of Arundel Ave and at the eastern end of Fairfax Ave. However, while the first of these must be completed before the cutting is made for the train the latter could be 10 years away. The problem then exists as to what happens to all this water when it gets to Forrestville Reserve. Under the current SMA proposal this eventually finds it's way into a new culvert in Wilberforce Walk. Unfortunately, there is a gap between these spots of maybe 200m. If the engineers don't get this right the cutting for the train will be a swimming pool and the swimming pool a swamp. The tenders to undertake this project have been received and only one of then requires the use of Millswood Park as a depot, if DPTI select this tender then there will be no changes to Millswood Park. In any case staff has determined that the tender would need to be approved by Council and we would have a right to refuse. What I'm hearing from people is that if safe access across the train line at that point can not be achieved then the application should be refused. The City of Unley provides grants to assist community groups and organisations to make a positive contribution to the community and cultural life of the City. Applications for the next round of grants are to be received by 5pm on Monday, 1 October 2012. The outcome of grant applications to the September 2012 funding round will be announced and funds distributed to the successful applicants in early December 2012. The Application form CG Sept 2012 (217 kb) (Word version) and Guidelines CG Sept 2012 (296 kb) for Community Grants and the Application form FE Sept 2012 (230 kb) (Word version) and Guidelines FE Sept 2012 (294 kb) for Festivals and Events can be downloaded from this site. Please read the Guidelines carefully to determine the eligibility of your group and project. This small pocket of land, as most of you would be aware, has been earmarked by DPTI as a depot site during the rail works. Council have included the many comments received by Don and myself into their submission.While I detailed the concerns for the entire project in an earlier blog this more recent notification was not included. It must be understood that this project is a federal government initiative that is being delivered by the state government. 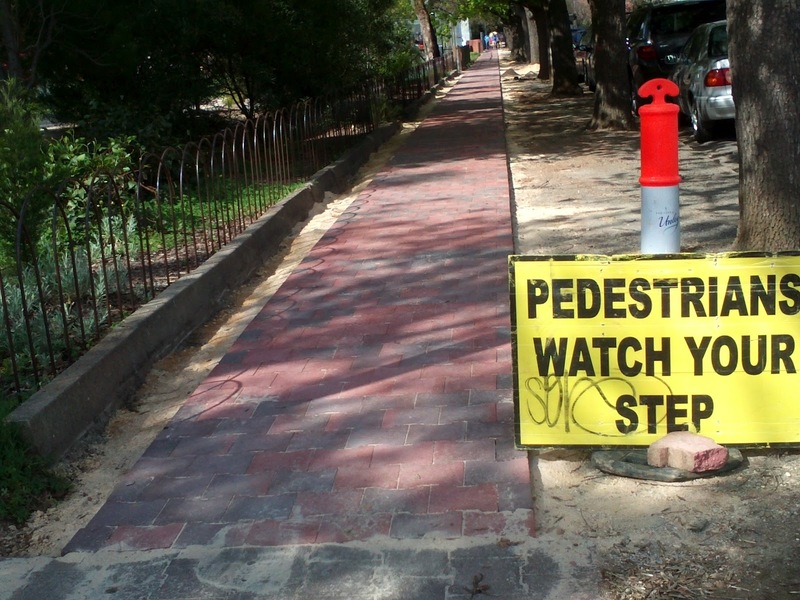 Unley Council has been consulted but that is it's only role. The access across the train line must be kept safe and usable through out the project. 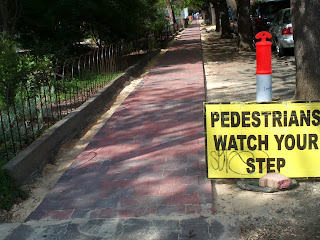 Safety must be assured for pedestrians , including children, that use the lane adjacent to the site. Clarity about the rent to be paid and who will be responsible for rehabilitation of the site,eg. guaranteed reinstatement. Use of the rail corridor for soil removal where ever possible. Operating hours restricted to Mon-Fri. Retention of as much vegetation as possible on the site. No car parking in the streets for workers at the site. Thanks for the many phonecalls and emails, they keep me informed and let me know what you are thinking. There has been much discussion recently among Councillors of the benefits of having this meeting and a Full Council meeting or simply two Council meetings each month. It is a legislative requirement to have a City Strategy meeting but not one that involves the entire Council, rather it could be a committee of Council. The difference being that those items that come first to City Strategy may be reserved out for further discussion by a member and decisions made at Council while reversible ( by way of a rescission motion) are considered final. The type of topic should be more strategic that goes to this committee, however, over time the choice of which meeting Items should go to have been more a matter of expediency than content. Strategic Urban Design and Planning Policy Programme- Quarterly Update; Some issues have been raised by the state government about DPA3A ( Greenhill Rd and Unley Rd), these include limits to public notification, increases in floor area, flexibility in building height and a 45degree interface along Unley Rd (rather that 35 degree). Most of these will be hard fought by residents in those precincts. The draft Community Plan is now in Councillor's hands and will be ready for consultation after being endorsed by Council. The Heritage DPA should be ready for consultation soon. This one from my point of view has taken 6 years now, the previous CEO promised me after delay after delay that it would be on the Minister's desk before the 2010 election and it was, now two years later it is still there, no doubt a little dusty. The government seems to set unrealistic deadlines for others and then fails to meet the information that they are provided with the respect and expediency it deserves. 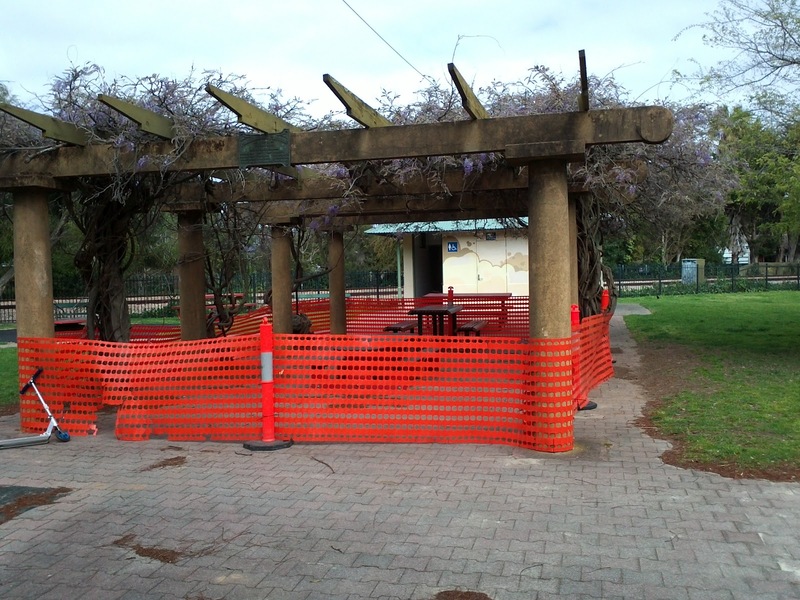 Council have been advised of apparent structural cracking in the cross beams that support this shade structure and vines. The structure has now been inspected by a structural engineer and the area has been bunted off to restrict access to the area pending a review of the problem and remedial action, if required. Council should know next week what repairs are necessary and how long the repairs will take. The location and size of culverts and suggesting the culverts stay to the east of the railway and only cross under it once near the tram overpass. While the culverts would be larger the extra length and disruption to Millswood residents would be minimised, reducing additional costs to the Stormwater Management Authority. This would also give greater flood protection as soon as completed in 12 months and not in 5-10 years. Diversion of traffic when Victoria St is closed. Risk audit is undertaken regarding safety and graffiti protection. How safe is the bike/pedestrian underpass at Goodwood? Over the last few days I have had two people ask me to investigate the safety of persons using this underpass. The path is the shared use area for train commuters, bicycles on the Mike Turtur bikeway and other persons just trying to safely cross under the rail line. The signage requests bike riders should dismount and walk through the area. My understanding is that this does not happen often enough. One person even observed the postie using the path on his motor bike! Any observations or suggestions are welcome. Thee following motion was moved and passed at the most recent Mitcham Council meeting on August 28th. They show that others are now concerned about what is happening with Brownhill Creek at the Goodwood junction. PM DURING DISCUSSION OF THIS ITEM. formulate the response to DAC. well, outlining Council's concerns with the GJRUP. Frederick St; Children Crossing signs are soon to be erected near the Scouts and Guides building to remind traffic to slow down. 50kph changes on Goodwood Rd have been welcomed by businesses and residents. Clarence Park Community Centre AGM is12:30pm on Sept 25th. Grade Separation consultation closes 5th September. Please read and have your say at www.dac.sa.gov.au . Interestingly public meetings may be held after this date. 669 South Rd; What should Council do regarding the annexing of Council car parks to access the rear of the property? Alternatives include removing the dividing fence, refusing consent and fixing the fence or charging for the loss of car parks at an agreed sum (suggested $15,000 per car park). Dunrobin St trees; The arborist report is complete and Council is still negotiating a way forward . 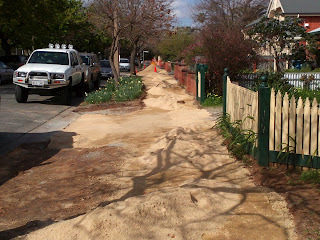 Fairfax Ave will soon have it's footpaths paved. 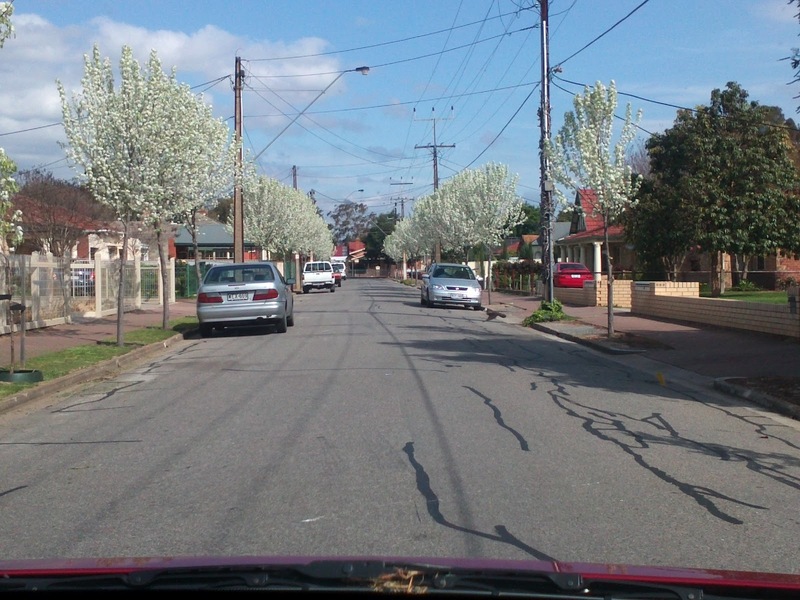 Residents have called for an audit of some of the street trees in Millswood Cresent. The report from the consultant regarding the Representation Review will be discussed at a workshop this week. It will then be debated at Council before again going back to the people to have their say. The report recommends some changes to the existing boundaries as well as some more radical changes. However, it is deficient in that it fails to discuss the loss of Supplementary voters due to legislative change and how to get these entitled voters back onto the roll. It also fails to address ways that might ensure better equality in representation by gender, age or cultural diversity. While some things seem to take forever to get done others happen quickly. After my letter boxing a couple of week ends ago I sent an email to staff letting them know the things I had noted. The rubbish was gone in 24 hours, the sewer inspection point that had been paved over was repaired and graffiti removed in 2 days, the broken street light fixed by ETSA in 3 days and the weeding and tidying up are in process ( Gray St).